“I replaced over 60 capacitors personally in 2017, and the previous owner recapped the entire synth about in 2008. This synth is fully functional and sounds exactly how it’s supposed to, but as with any Omni Ive ever seen, the square black buttons do not engage every time. I’ve found that pushing them in in a slightly downward motion is the most effective way to turn them on and off. I purchased the road case from RoadcasesUSA. It has wheels and two handles and plenty of cushion to protect the synthesizer. I am including an extra High F key. I am also including the capacitor kit I purchased, which contains every capacitor on the board that I haven’t replaced. “I’m clearing out my storage. This synth used to work fine before having some issues with power supply. It’s been sitting in my storage for more than 15 years. I haven’t test the key due to not damaging the synth before being tested by a technician. “Vintage ARP Omni-1 String Synthesizer: Just got this thing serviced. a few problems remain (lowest F key has triggering issues when played up the scale from notes preceding but not when played down from notes after it. some slight sustaining note issues. 8′ Bass Synthesizer button needs a slight tap, not a full press, to stick), but this thing was brought back from being completely dead! I don’t see this costing too much more to fix. It IS usable as is though, just has those couple of quirks about it. ” Auction ended. Click here to browse on eBay. “This item successfully powers on. This item does not work properly and will require repair. Unit does not produce any sound. The light on the Power switch illuminates, but no other LEDs light up. Therefore we are selling the item without a guarantee for Parts/Repair. Please bid accordingly!” Auction ended. Click here to browse on eBay. “ARP OMNI , Zustand gut ,,,Gebraucht ohne garantie …Versand kosten Frei (in Europa)” Auction ended. Click here to browse on eBay. “Selling this synth is like losing my right arm. Ive owned it since 1988… a gift from my Uncle who had it since new in 1975. In 2001 I had all the capacitors replaced (by the “Man with the Golden Fingers” in Elsternwick Victoria. He gave it a thorough overhalling and as a result it works perfectly. Its missing 3 of the slider tabs but otherwise is in perfect working order complete with instruction manual. It comes complete with carry case (hand made by my Uncle). The serial number is 2485 0011″ Auction ended. Click here to browse on eBay. Funktionen geprüft. ALLE Fotos zeigen das hier angebotene Gerät.” Auction ended. Click here to browse on eBay. “ITEM: For your consideration is this vintage 1975 ARP Omni synthesizer. The Omni (model 2483), was billed upon its release as the first “symphonic” keyboard, for its accurate representations of string sounds. Examples of the Omni in use include Modern English’s “Melt With You”(video capture pictured in the gallery to your right), and Kansas’ “Dust in the Wind.” The ARP Omni is a very practical, dynamic, and accessible analog synth great for numerous applications, so take advantage of this No Reserve auction, and get a great deal on this great synth! Features of the Omni Mk1 include: a 41-key keyboard, divide-down polyphony, (4) preset sounds: Violin, Viola, Cello and Bass, the former two being polyphonic, the latter two monophonic, (1) variable speed LFO with a Sine wave shape, Chorus Phaser and Waveform Enhancement, controls for Master Volume, Mix, Bass Volume, Attack and Release. This particular example, serial number 2483- 0149, is in excellent working condition and very good cosmetic condition showing expected signs of wear or use. As is immediately noticeable, there is adhesive residue present on the front side below the keyboard. Besides that, this example is in great shape. Be sure to examine our photographs in the gallery to your right, all of which are of the actual item. This synth works very well, though there are a couple small issues that should be noted: The second to last white key doesn’t work, and the whole unit is slightly out of tune. We have not serviced this unit, however for those that do not have access to a qualified technician, we can easily do so at the request of the winning bidder with an additional charge that will be determined at the time of the fix. 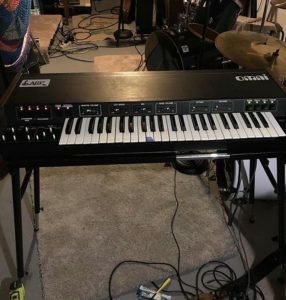 Other than those two relatively minor issues, this synth sounds magnificent providing the beautiful, warm, vintage synth string tones that this unit has become renowned for.” Auction ended. Click here to browse on eBay. “Nice looking original mid 70s analog synth! This one has been idle for 20+ years. It had a power supply issue in the 80s and hasn’t been played since. The keys look nice and don’t sport that uneven look that most of the heavily played models do. The case and sliders all look pretty good and seem tight. The slider knobs on some are missing (typical). This unit is sold as is, and non-functional, but is complete and should have a lot less play than most you will see. It is a classic axe used by Gary Numan in Tubeway Army and Joy Division on many early wave tracks. It was made from 1975-1977, making it a very nice early analog. I’m thinking that this should restore very nicely into a great player. It also is the only Arp Omni on Ebay at the moment (including all other models) and is the rarest of them all, the flagship model, the most expensive one as well (when purchased new). ” Auction ended. Click here to browse on eBay. “I’m reluctantly selling my lovely Arp Omni to fund a deposit on moving home. This is in good working order, with quite a few scratches here and there but certainly not bad looking for a 35 year old instrument; it has a couple of missing slider caps, and one key that is a bit resistant; by no means perfect but entirely operational. It is US 110V but I can include a step-down transformer for UK mains. This is the MK 1 version which is a lot rarer than the later orange and black Omni-2. It is also in my opinion warmer sounding. The Omni comprises a string machine and 1-VCO synthesiser with LFO (and slider for rate), VCF cut-off and resonance, an ADSR, and includes chorus phaser and waveform enhancement effects to add colour to the basic sound. I’ve taken some photos so that you can see all the features. The string sounds are beautiful and rival the Solina in their lushness. The keyboard splits when bass and cello are selected so that you can play vioilins/violas with your right hand and the lower stuff with you left hand. There is a mixer to get different volume levels for the synth and strings. It has the usual suite of connections on the back (again, see the photo).” Auction ended. Click here to browse on eBay. One Slider is broken,” Auction ended. Click here to browse on eBay. “This is an ARP OMNI model 2483 vintage analog synthesizer keyboard. This is an awesome vintage synth. This one is in need of repair. You can get sound out of about two-thirds of the keys, some functions seem to work, some don’t. Volume output is low and most of the sliders are hard to move. Has normal wear for a vintage synth. This is an amazing synth and would be a killer synth once it’s repaired.” Auction ended. Click here to browse on eBay. Je vends mon Arp Omni 1 en trés bonne état et fonctionnant parfaitement bien . Tout les sliders fonctionnent et aucun ne crachent . Le clavier est excellent et 2 pédales Arp sont livrées avec ( filtre & sustain ) . I sell my Arp Omni 1 in very good condition and working perfectly . All slides work 100% and no crash . The keyboard is perfect and it comes with 2 Arp pédales ( filter and sustain ) . Best regards , ” Auction ended. Click here to browse on eBay. “arp omni mk1” Auction ended. Click here to browse on eBay. “Ich versteigere meinen alten Arp omni MK 1. Der Synth ist aus dem Jahre 1975 – 1977 und hat seine Aufgaben im String Ensemble und Synth Bereich. Er hat sehr agressive analoge Sägezähne, wodurch sein Bass Sound einmalig ist.” Auction ended. Click here to browse on eBay. “Up for auction is a fully working Arp Omni I circa 1976. It’s in good cosmetic condition and it’s had some work done to it. Most, but not all of the infamous tantalum capacitors have been replaced including the whole upper voicing board that causes the common stuck note issue. Some op amps have been replaced also. All sliders have been cleaned using the “Lightner method” and are working smoothly. The keys trigger evenly. It sounds great. Happy to answer any questions. Sold as-is. This is a vintage electronic instrument and comes with no warranty or guarantee. Please be prepared to call me directly in the event of any problems so that we can sort through them in a civilized manner.” Auction ended. Click here to browse on eBay. “HERE IT IS AGAIN! DONT MISS IT! This is an ARP Omni 1 in EXCELLENT CONDITION . All slider/pots have been cleaned and are working perfectly, 2 notes seem to be bleeding, 1 note does not work at all (but it looks like a very simple fix), and the LFO slider knob has been broken but you can still use and it works fine. This Synth is in great shape for its age and SOUNDS AMAZING! I am also including a box of parts that should cover the needed repairs.” Auction ended. Click here to browse on eBay. “Thanks for visiting my auction. Today I have a vintage Arp Omni from I believe 1975. I’ve gotten about 85% of the way resurrecting this girl and have lost interest. Its been recapped ( all Arp Omni keyboards need this to function) and other ICs replaced to get to this point. The only issue now are the last 3 sliders in the synth ADSR section need to be replaced. All the keys work and sound. Like I said; it is almost there and could definitely be used as is….. Fat, luscious, phasin’ quirky strings– nothing sounds like it.” Auction ended. Click here to browse on eBay. FULLY working condition, mechanically sound! Payment MUST be made 24 hours after auction ends. Due to age of item it is sold as is and no returns accepted” Auction ended. Click here to browse on eBay. “Good condition, fully functional” Auction ended. Click here to browse on eBay. “VERY NICE CLASSIC ARP OMNI 2483 COSMETICALLY FINE THE ONLY THING THAT DOES NOT WORK IS THE CHORUS PHASER BUTTON? AND IS MISSING THE LITTLE BLACK SLIDER KNOB FOR ATTACK OTHERWISE COOL UNIT NO DIGITAL CAN MATCH THIS SOUND!!!! !” Auction ended. Click here to browse on eBay. “This is a very rare synth and there are few of these advertised now. There are even fewer in 100% working condition and excellent cosmetic condition so grab yourself a rare piece of vintage synth history while the auction lasts. This is a significant development in Arp’s history of synth building in that the synth benefits from a string section, a kind of organ/Hammond section and a synth section also. This is quite unusual to find all three in one box of analog tricks and is a masterstroke in Arp’s engineering skill. This is very analog if you can have very analog as opposed to not very analog!!! If you know what I mean!!! What I’m saying is that this has all the analog stuff inside, you know the wonderful voltage controlled oscillators that need to warm up over a 10 minute period and a fantastic voltage controlled filter which simply cannot be matched by its digital successors in today’s analog modelling market. The richness of this synth is unparalleled and some of the bass sounds attained by using the actual synth section are crisp. You can get wacky blips and bleeps out of this thing too. The organ and kind of Hammond organ sounds are quite convincing but obviously not sampled and therefore sound slightly manufactured but that’s quite fun. I just love the string section. There is just nothing quite like Arp’s string synths. They have that rich 70s sound which conjures up memories and images of 70s sitcoms and early 80s and I mean very early 80s cheeeezzzy pop music. It really is great, I mean you know what can replace these things really? Nothing. It’s a beauty.” Auction ended. Click here to browse on eBay. This Omni was in our repair shop, but the owner decided to sell it instead of continuing to have it fixed. The Omni turns on, and the bass section works, but the rest of the keyboard needs some TLC. The regular and string synths do not work, and the case is missing some screws, so this item is being sold AS-IS. But if you’re feeling a little adventurous and know something about fixing vintage electronic gear, this is your chance to a BEAUTIFUL-sounding analog synth and a great piece of music history for a lot less than the usual price. Serial Number: 24831390” Auction ended. Click here to browse on eBay. “This synth’s original owner recently passed away. Everything lights up and works. This keyboard is in overall good shape I took pictures of a scratch on one of the wooden sides, it’s a black scratch and didn’t really mess up the finish, it’s a black scratch. On the top side of the same wood piece it has a chip on the top corner, I also took a picture of that to show what it looks like.” Auction ended. Click here to browse on eBay. “This synth’s original owner recently passed away. Everything lights up and works. Keyboard looks in great shape! ” Auction ended. Click here to browse on eBay. “THIS KEYBOARD HAS BEEN IN ONE FAMILY SINCE IT HAS BEEN MADE BACK IN 1980. IT HAS NEVER BEEN PLAYED OR BEEN AROUND CHILDREN. IT IS OWNED BY AN ELDERLY COUPLE. THERE IS HARDLY A FLAW ON TIS MACHINE, IF ANY THEY ARE VERY SMALL IN SIZE AS IDIDN’T NOTICE ANY.THIS UNIT WAS RETUNED 3 YEARS AGO (AT A COST OF 750.00). WE ARE SELLING THIS ITEM FOR SOME DEAR FRIENDS OF OURS. WHO ARE IN REAL NEED. THE OWNER, PLAYER OF THIS KEYBOARD JUST RECENTLY NEEDED MEDICAL ATTENTION AND HAS BEEN MOVED TO ASSISTED LIVING. SO IN HOPES OF HELPING WITH THE HIGH BILLS THEY ARE WANTING TO SELL SOME OF THEIR ITEMS. OTHERWISE THIS ITEM WOULD NOT BE BEING LISTED FOR SALE. THEIR IS ABSOLUTELY NOTHING WRONG WITH THIS ITEM.” Auction ended. Click here to browse on eBay. “This Omni is in good cosmetic condition (minor scratches on the top as pictured) which is unusual,especially for the original model. It has been recently serviced and the slider pots cleaned so that all adjustments during playing are smooth and crackle free. Three of the slider caps are missing. They of course do not effect the playing of this synth in any way but are purely an aesthetic concern. They can be ordered from the UK or found occassionally on eBay.” Auction ended. Click here to browse on eBay.